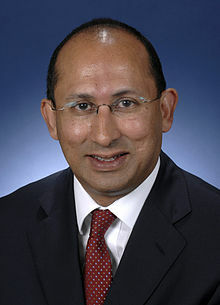 Peter Varghese took up his position as Australian High Commissioner to India in August 2009. Prior to his posting, he was for ﬁve and half years the Director General of the Ofﬁce of National Assessments (ONA) in Canberra. From June to December 2003, Mr Varghese worked in the Prime Minister’s personal ofﬁce as the senior foreign and defence policy adviser to then Prime Minister John Howard. Mr Varghese is a career ofﬁcer of the Department of Foreign Affairs and Trade, which he joined in 1979. He has served in Vienna (1980-83), Washington (1985-88), as Minister (Political) in Tokyo (1994) and as High Commissioner to Malaysia (2000-2002). In 2010, Mr Varghese received an Ofﬁcer of the Order of Australia (AO), for distinguished service to public administration, particularly in leading reform in the Australian intelligence community and as an adviser in the areas of foreign policy and international security.